Standing at lake looking back at cottage! Living Area! Flat Screen TV-39" with DVD Player! Sofa with Queen size bed! View of lake from cottage's patio area! Upper level bath with shower stall! Upper level - 2 of 2 bedrooms-full on bottom and twin on top! 2 night weekend $325 +$200 dep. 3 night weekend $425+$200 dep. With 6 month lease, $850/month-includes: trash, well water, city sewer-Antena TV-furnished - snow removal - washer & dryer! Tenants pays Gas & Ele. Cable & Internet if you want it! View of All 3 Cottages! Cottages #1 #2 & #3 are side-by-side! Patio Area's plus decks on all 3 cottages! McDonald's! When sitting on the deck, you are looking across the lake at the State Park Peninsula! 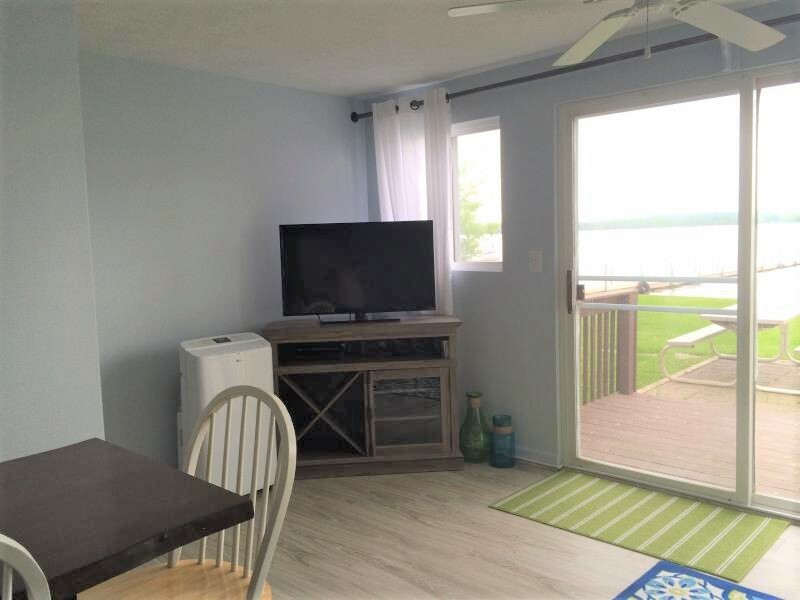 Recently refurbished 2 bedroom – 1.5 bath lakefront cottage! About 800 sq. ft.- Sleeps 6 comfortably - max. occupancy no more than 7 including children and infants. Fully furnished: new gas stove & microwave, ref. toaster, coffeepot, blender, pots, pans, dishes, charcoal grill, picnic table, fire pit, washer & dryer. 2017 season will have Central Air. All linens & towels provided – you may want to bring beach towels! 1 bedroom with King size bed – 1 bedroom bunk with full size bed on bottom & twin on top – sofa in living room with Queen size sofa bed. 39” Flat Screen TV -WiFi wireless , also 23" Flat Screen TV in King Size Bedroom. Dock for your boat- also several area marinas do rent fishing & pontoon boats. So do we. 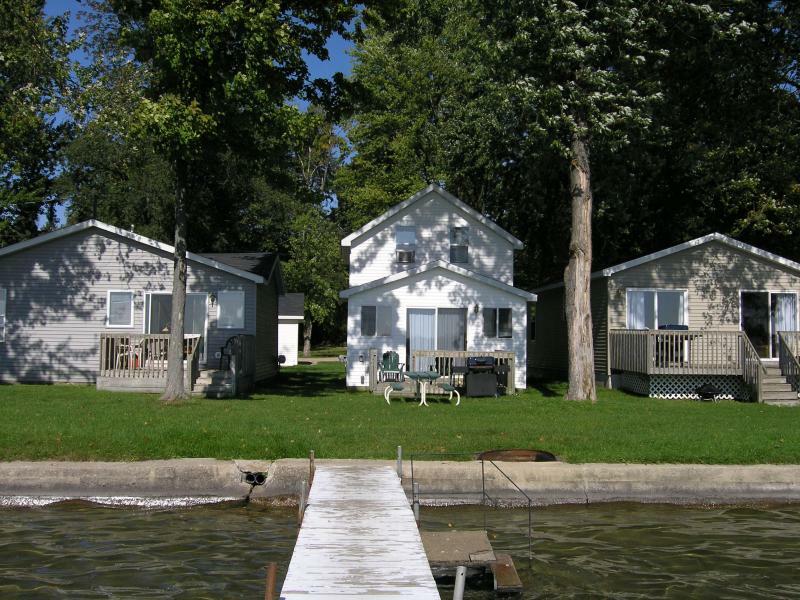 Cottages #1 #2 #3 are all side-by-side-great for family reuions and located on the west side of West Gun Lake, right off Patterson Rd. -Lutone Circle/Ave. is also known as Russell Dr. use Map Quest for actual location! Security deposit of $200.00 is required to reserve your week – deposit refunded only with 60 days notice of cancellation. Off Season 5-6 Month Lease Required -$825 + Gas & Electric-CABLE TV - INTERNET AVAILABLE AT YOUR EXPENSE-other utilities included! Rent due -in full- 60 days prior to your arrival. NON-REFUNDABLE unless able to re-rent your week(s). Security deposit refunded within 15 days of your departure with cottage being left in good condition! This cottage is also available weekly, for a long weekend or monthly during the off season.